Knicks center Joakim Noah purposefully skipped dinner with West Point Army cadets and a speech from a retired colonel because of his stance against war. The Knicks held their third consecutive training camp at the United States Military Academy at West Point, for which Noah said that he has “mixed feelings” about being there. “I’m not anti-troops. It’s just not comfortable for me to see kids going to war and coming back having seen what they’ve seen and done what they’ve done. It’s sad for me,” Noah said. “It’s his right,’’ Hornacek said. “We want him part of the team group. He just didn’t feel comfortable. We’re not going to pressure him into doing that. We had a speaker who I thought was fantastic. I told him maybe I can get him a copy of the speech, so he can hear some of it. It’s his right. That’s fine. Noah said that his decision was not a form of protest at all such as what Colin Kaepernick did by not standing for the national anthem. He did say that he did support Kaepernick’s decision. “I’m not a patriotic person,” Noah said. The U.S. Military Academy said that they were “disappointed” with Noah’s “inappropriate decision. 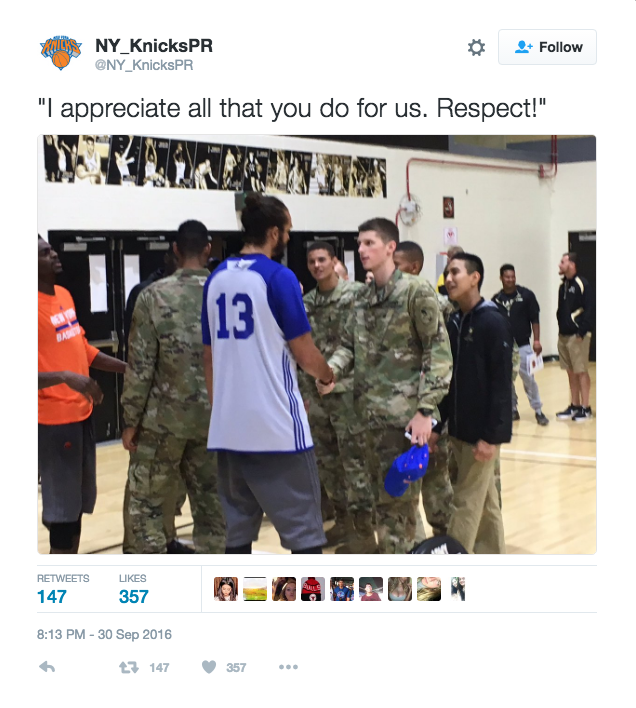 Following the statement, the Knicks PR team tweeted photos of Noah spending time talking with cadets.